In addition to the historical thriller 'The Dancing Barber', he is also the writer and illustrator of the Curious Characters series of illustrated children's books, which include 'Snake, Rattle & Mole', 'The Squirrel's Flea' and 'The Donkey & The Skunk'. Visit www.acmichaelbooks.co.uk for more information. 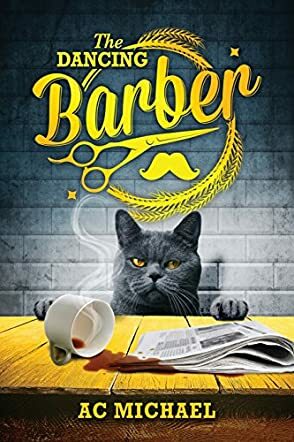 The Dancing Barber by AC Michael is a novel with powerful historical hints about a Ukrainian who was able to survive and even escape the worst of the cruelties of the Soviet communist dictatorship. This story is set against the backdrop of the Soviet Union under Stalin. The horrors of the gulags, the inescapable suffering to which millions of people were subjected, seemed to have been spared him. But when he thought he’d left the monsters behind and has settled to a quiet life, he is suddenly awakened to reality thirty years later by a visit from “friends” from his past; it seems like being Ukrainian was a curse from which one never finds an escape. Taras has to face an unforgiving enemy from his past and this time will he be lucky enough to escape? AC Michael is a good storyteller with a sharp sense of humor and, even in the midst of terrifying and gruesome circumstances, the author still succeeds in putting a smile on the faces of his readers. Readers can’t remain indifferent to the powerful characters featured in the story, like Taras, Voloshin, and Klem. The writer has masterfully integrated historical elements into the tale of a man who discovers at the end that he can run away from dictatorship and his worst enemies, but not from himself. The different levels of conflict explored in this spellbinding story are deep and will intrigue readers at every turn. The plot is intense, fast-paced, and at every stage of the story the readers’ interest only gets stronger. Lovers of historical fiction will undoubtedly enjoy The Dancing Barber. I loved it. The author's voice came out naturally and clear. Wow! Just, wow! That's exactly what I thought when I finished reading the epic new work of historical fiction by author AC Michael, The Dancing Barber. Follow the story of Taras, a Ukrainian Partisan man fighting against Stalin's Soviet Army, with all the dangers that entailed. Taras survives the experience, but at times just barely, and his life is forever changed. Fast forward thirty years and we find Taras with a family, living happily in England, on the verge of great success. But two of his former acquaintances show up and expect Taras to house them, and bring up things from Taras' past that he would rather leave behind him. Will Taras be able to keep the things he did in what seems to him like another lifetime behind him? Or will he have to deal with the things he did in the war once and for all? You'll need to read the book to find out. I very much enjoyed The Dancing Barber. Author AC Michael has done a great job in creating characters that his readers will connect with and care about, a true hallmark of a great author. His historical scene setting skills are second to none, and readers will feel as if they can simply slip through the pages to war torn Russia as well as mid century Europe. I am pleased to highly recommend The Dancing Barber to any reader who enjoys historical fiction or just a great read of fiction in general. I look forward to reading more from the talented author, AC Michael, as soon as I possibly can, and hope that he is hard at work on his next great work even now! The Dancing Barber by AC Michael takes us back to the Soviet era under Stalin. Being a Ukranian in this time period was as dangerous as any of the top dangerous jobs of the modern age, if not more so. Millions died in 1933 of famine and millions more were sent into the infamous gulags and never heard from again. Taras was one of the lucky ones; he survived but his life would never be the same. Thirty years on from that terrible time, Taras is happy with his family in England and about to reach what so many dream of - fame and fortune. Until Klem and his alter ego Voloshin move into his attic space and start digging up the past. Things get haunting and then dangerous when a Soviet Colonel bent on silencing the truth arrives ... angry. This is my first book by AC Michael and it will not be my last. This book grabbed my attention from the first few words: '“Here," said Tato, "dinner is served.” He held out an old saucepan lid, piled high with cubes of boiled shoe leather...' It may seem like such a simple introduction, but it truly serves to pull you into the lives of everyone in this book. This story will put you through the wringer emotionally, but it also has intrigue and danger and shows you just how far humans will go for many things. It shows how the human spirit can endure and also how cruel it can be. Lessons that even now in our modern age still ring true and are a stark reminder of things. This book is finely crafted and the story spills onto the page in just a perfect way. I recommend anyone interested in history, or just a really good read that will have you wanting to talk to your friends about it, should read this book. The Dancing Barber is a humorous historical thriller by A.C. Michael. The novel opens initially with the poverty stricken world of 1930s Ukraine, a period of Soviet Union history which is rarely explored by mainstream fiction. Peasants with an already difficult life are exposed to the vicious and controlling ways of Stalin’s soldiers, whose desire to solve ‘the Ukrainian problem’ results in violent torture and death en masse. Taras, our central character, is born into this horrific world, but years later his new life in 1960s England appears to be taking a turn for the better. This is the moment that a pair of faces from his past reappears, and we discover that the Soviets are still trying to cover up the sins of their past. This epic read is not for the faint hearted, but it will reward those historical fiction fans who are looking for a unique new slice of the past to enjoy. I have never read any kind of historical fiction from Eastern Europe before, and I found the whole experience to be harrowing, dark and thrilling. Taras’ experience and those of the peasants who managed to survive under Stalin’s rule are startling and dramatic, and it helps the audience to understand the unusual main character we are presented with in the novel’s main timeline in the sixties. A truly human story at its heart, this tapestry of characters, secrets, relationships and hardships is peppered with humour that undercuts some truly terrifying moments. A.C. Michael’s The Dancing Barber is not to be missed. The Dancing Barber by A.C. Michael is the sometimes funny, sometimes tragic, and always entertaining story of Taras. He was once a Ukrainian living in Stalin’s Soviet Union. Regardless to say, he lived vicariously and dangerously. When the famine hit, it hit hard and Taras was one of the very few lucky ones who left the place alive, but not unscathed. His life changed dramatically and he knew it. He never got the recognition for his talent that he should have. But 30 years on and living in England, he finally has everything he always wanted; a family, fortune, and recognition for his talent. However, things are not as easy as he thought they would be. His past is back to wreck his life. An angry Soviet Colonel reappears in his life and things could not be worse for Taras. With his past blocking his bright future, what can Taras do to live his life the way he wants to? First of all, I love the way this novel was written. From the beginning, it had an eerie feeling of doom that kept me excited and wanting more. I could taste the suspense and, at some points, my hands were sweating. This is some seriously powerful writing. The chapters were divided into acts, which gave a theatrical feel to the book and, because of this, I could picture the characters and I could imagine how they would look and sound. This is world class writing, a book you will enjoy and pass on to others!